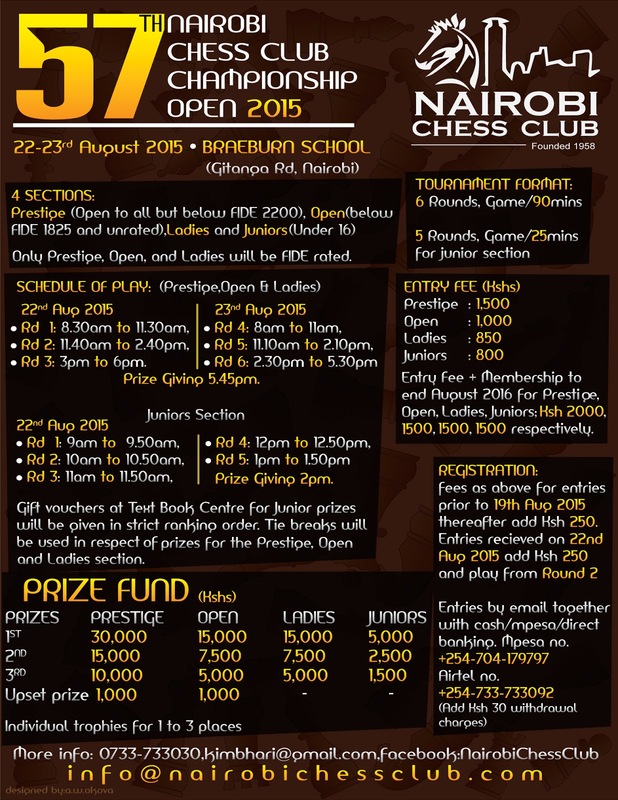 One of Kenya’s most anticipated event this year is the 57th Nairobi Chess Club Championship which is set for the weekend of 22nd & 23rd August 2015 at the famous Braeburn School, Gitanga Road, Nairobi. The Chairman of the club Kim Bhari had been harping on about this event for the past 2 months on various Social Media like Facebook and Twitter. The good news is that he kept his promise of Bigger and Better and this will delight the many chess players who are expected to grace this event. Their poster was done by Committee Andrew Okova who did a great job on the poster compared the drab communist style poster of the past. I have enclosed a poster from the 2014 to see what I mean! 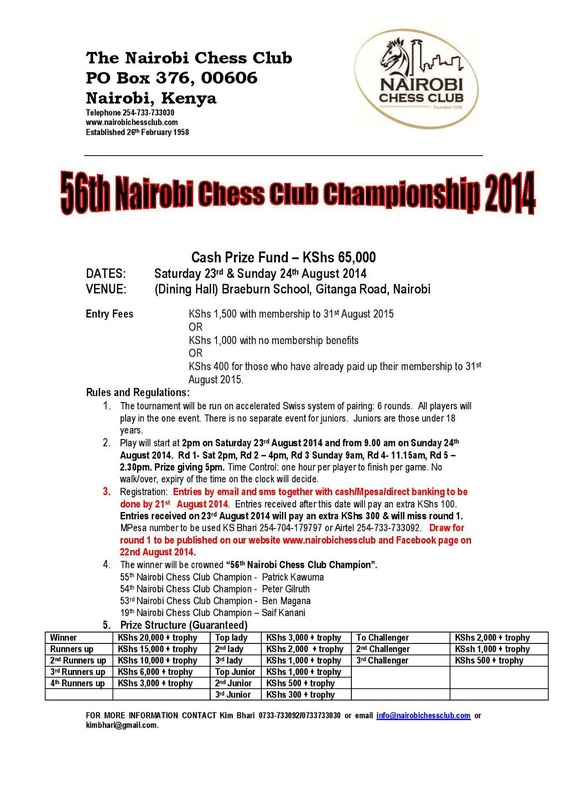 As promised this is a FIDE rated event which will enable many Kenyans to join the +100 Kenyans on the FIDE ranking system. This year’s event for starters has 4 separate sections and a much bigger prize fund which is a staggering KES 121,000 (approximately USD 1,200) with a top prize of KES 30,000 (USD 300). To make the ladies fight to the bitter end a separate event for ladies has been set up with a top prize of KES 15,000. It will be interesting to see how many ladies turn up for this event and slug it out. Last year’s event attracted a total of 74 players and was won by veteran chess administrator Lawrence Kagambi with a perfect score of 5/5. Many players were unhappy with the 5 rounds last year with many complaining that 5 rounds accelerated is way too short and in fact the event should have between 7 to 8 rounds. Guys – which planet do you live on? 7 to 8 rounds of 90 minutes each means that one must have 3 full days for chess! To satisfy players insatiable demand for chess this year’s event has been set for 6 accelerated rounds and promises to be a tough fight for top positions. 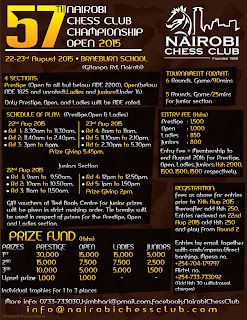 Ben Magana who won the 55th edition in 2013 and took home KES 18,000 out of the KES 59,000 prize fund is expected to be clear favorite due to his incredible form by winning the 2015 Kisumu Open and the 2015 National Speed Chess Championship. Mehul Gohil who is breathing fire after being banned from the 2015 Speed Chess Championship has vowed that he is coming to win this event to silence all his (and he has many!) critics. 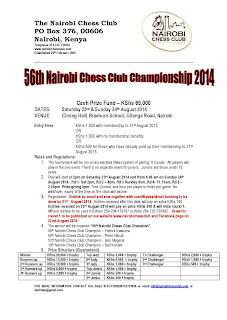 I had in an earlier article title “Fireball Hits Kenyan Chess” talked about the dumb move by Chess Kenya when they announced the bank. 2015 Kenya National Bltiz Champion Joseph Methu who is also the Kiambu Open Champion is expected to be the proverbial Dark Horse in this event. Will he triumph once again and prove to his detractors that he is a worthy player who is getting ready for the 2016 Baku Olympiad? Only time will tell. This event has run continuously from 2012 and which was won by Peter Gilruth who pocketed KES 7,500 out of a prize fund of KES 29,500. All chess events need a Godfather (sponsor) and this event is no exception. The Godfather of this event is Rodgers Adai of ARM Engineering. A strong player who represented Kenya at the 1988 Olympiad in Greece and who was one of the player who drew against GM Dimitri Reinderman in 28th July 2011 simultaneous match dubbed “GM Dimitri Reinderman v Rest of Kenya Match”. Rodgers Adai has been the main sponsor of this event from 2012 and is an old University chum of Kim Bhari. We will of course bring you the the usual gossip and latest from this event. Stay tuned!